Misery Index: l'extreme metal band americana partirà ad Agosto per un nuovo tour europeo che farà tappa in Italia il 22 del mese al Slaughter Club di Milano per un unico appuntamento tricolore assolutamente imperdibile! 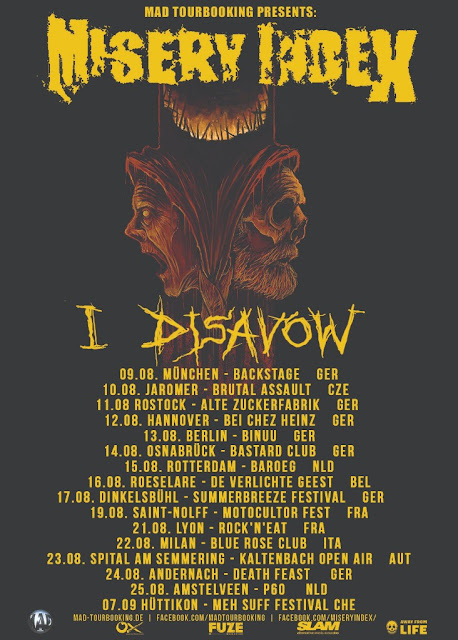 Misery Index: the USA based extreme metallers are announcing their death metal rampage through either a heat blasted or rain drowned Europe this summer. The American musical extremists will kick of their tour at the Backstage in München (DE) on 9th of August, and continue to devastate 6 more countries before their final assault at the Meh Suff Festival in Hüttikon (AT) on September 7th. Check out below all the tour dates announced and make sure to catch'em on stage!